Find here information on how to withdraw money from your Live Account. Complete the form bellow then click Print-friendly, print it and sign it, and return it to GCI via email along with a copy of a valid identification. 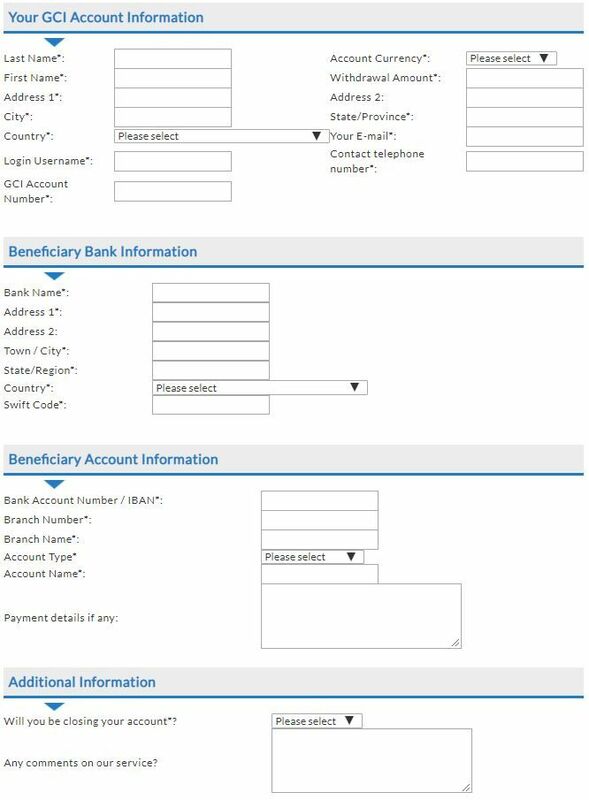 This form may be scanned and emailed to payments@gcitrading.com and in a copy to info@goldstarway.com. send your signed scan to payments@gcitrading.com and in copy to info@goldstarway.com. Please be sure that you have completed all fields, including contact information and signature. Withdrawal forms that are not fully completed, submitted online and also signed and emailed to us will not be processed. Affiliates withdrawing commissions: Input your Affiliate number for "Login Username" and put "affiliate commissions" for "Account Number"
Forms submitted with missing information are subject to delay. Attention! In case you obtained Bonus Trading Margin for your Live Account, it is not possible to withdraw received amount. Bonus will be gradually reduced after the withdrawal.